This post was written by a friend of mine, Jarhead Survivor. If anyone knows how to survive in the wild, it’s him. Check out his site – http://www.shtfblog.com. I’m sure Joe has written about this on his blog at some point because he’s an outdoorsman. But I think it’s important enough that it gets said as many times as possible. Not long ago a 27 year old man up here in Maine died from exposure. He was going to a friends house and decided to take a shortcut through the woods. It was mere hours after the biggest blizzard we’ve had in ages and he must have got lost and disoriented in the snow and unfortunately he succumbed to exposure before he was found. There are several take-aways from this sad story. First, a true outdoorsman would never have gone into that environment – dark, windy, and probably zero degrees with blowing whiteout snow conditions – without the proper clothing and at least a minimum of gear. Knowledge and experience of what to expect could have saved this guy’s life. I was in the woods earlier that day during the height of the storm and I had a small pack with my everyday camping equipment and was wearing good winter clothing. I was snowshoeing and the snow was already pretty deep at 2:00 pm in the afternoon. It was hard going even with snow shoes, so I can guess what it was like for this guy without any special gear after it got dark. Several factors come into play here: physical conditioning, proper attire, good gear, knowing where you are, and the ability to think under stressful environmental conditions. I can almost recreate what happened that night: He might have had a little too much to drink or maybe some other mood altering drug (I talked with the police chief about this and he didn’t deny it when I spoke of this). After deciding to go to his friend’s house he walks outside and decides he’s going to shortcut through the woods. He probably had a decent coat, hat, and gloves, and maybe was even wearing good boots and long johns, but when he made the decision to go through the woods he sealed his fate. He probably had a flashlight as well, but after walking just a few hundred yards he most likely became disoriented. I would wager a $100 that he didn’t have a compass or some kind of GPS. Even if he did the wind was still blowing extremely hard as the low pressure system moved off the coast and there were white out conditions adding to the pitch black of night. You might say, “Why didn’t he just follow his tracks out?” to which I would give two answers. First, once he figured out he was lost he almost certainly panicked. Alone in the woods, lost, and cold, he might have run for a bit. That’s your first instinct when you discover you don’t know where you are. If you don’t believe me try it. I’ve been there and there is indeed a moment of extreme fear that dumps some adrenaline into your system causing you to want to run to find out where you are. The second reason is that it’s fairly easy to double back on your own tracks, so that you’re walking in a circle. It can be difficult during the day to find out where you walked into the circle – especially if it’s a big enough circle. At night under those conditions it would be nearly impossible to find your way back. Also, the snow was very deep out there – one officer went out and reported snow up to his chest in some areas, so the victim wouldn’t have run very far. At that point he was probably as warm as he was going to be. Moving through the snow is very difficult and his body was working hard and the exertion was keeping him at least partially warm. Then he would have run out of steam and stopped running and a that point he would have started to get cold. At some point your brain closes down and stops working properly. He would have felt cold at first and then some accounts show that people will actually tear their clothes off as they pass a certain point of freezing to death. Maybe they suddenly feel hot all over. Either way this guy’s time was now limited. At some point he stopped shivering and shortly after his vital signs would stop. Another victim claimed by poor decisions, inexperience and a lack of knowledge on how to survive in an environment like that. Add to that some alcohol or drugs and his fate was sealed. So how does one actually gain knowledge and experience? Answer: The hard way. You need to get some dirt time in. By that I mean you have to get out in the woods and practice the skills you need in order to survive. If you’ve never started a fire begin by using a lighter and some paper with dry tinder stacked on top of it. Once you get a feel for that start using materials you find in nature for your tinder and kindling. Once you feel you’ve mastered that start using a fire steel and experiment with different materials to catch a spark (Hint: cat tail fluff works great for this). Don’t just start fires in good weather either. Try and get one going when it’s raining or snowing. Get used to working under adverse weather conditions. Research what kind of clothing you should wear under different weather conditions. For example: don’t wear cotton in cold weather. If it gets wet from sweating or snow or whatever it has very little insulative value to you. Wool or synthetics are a much better option. Get out there and see how it feels when you sweat in polypro underwear when the temperature is ten degrees. 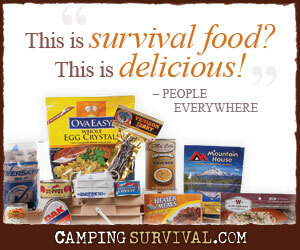 Find a survival knife that works for you and put together a good survival/camping kit. See how much gear you can cut out for an overnight survival trip. You’d be amazed at what you can do without once you have experience and knowledge of the woods around you. If you go out in the woods under carefully controlled conditions when the time comes and you find yourself in a tough situation, you’ll have a much better chance at survival if you’ve already practiced survival skills and can keep your head. So what are you waiting for? Get out there and have some fun! Following his own tracks would have been nearly impossible with any blowing snow, they would quickly cover-up. Once disorientation sets in due to panic, physical difficulties, being cold, etc you must regain your thoughts on how to move forward and find safety. Back in my younger days I would spend my a hour ice fishing. Needless to say when there’s snow on the ice and the wind picks up, your visibility can down to mere feet (and not many of them). Staying put and getting your head together is the best advice I can give, besides don’t go by yourself, tell someone where you are going and when you will return. Don’t forget a phone. Food, water, shelter. Not necessarily in that order! If this poor 27 year old had some experience, he would have realized that digging a decent snow shelter would have been his best option. If he could have calmed himself, he would have realized that at some point, people would have been looking for him. Shelter: build it first for the bitterly cold weather, once you realize that you are stuck. Water: it was in abundance, in the form of lots of snow (there was no easy mechanism for melting it, but it wasn’t really immediately necessary anyways). Food: he could have gone for days without it. Where was his cell phone? Not working? No signal? I don’t think that I know of a single 27 year old without a cell phone! Completely agree. You have to spend time gaining skills and knowledge in order to survive. If you fool your self into thinking that you can just go off and survive with no training… You are screwed. I have a fever, am coughing and feverish and feeling terrible. My thought: Where would a person find a cat out in that weather, and how on earth could you pull out the fur from its tale for a fire without the cat going ballistic? Okay, I do have a question. Are you saying polypro underwear is good or bad for that weather? Since it is a synthetic, which you recommended, it seems you are saying it would be good to wear. ??? It may seem like reconciliation is right around the corner and that you’re only a few messages away from jumping back into his arms. that is when having an “attitude of gratitude” plays a key role. now and relive your favored functions once again and once more! Invitation lists are crucial if you are seeking publicity for your styles. Some style displays have an admission cost for public attendance. pirater compte facebook forum. perdre considérant carte, compte facebook temporairement verrouillé solution. a shout out from Austin Texas! Just wanted to say keep up the great work! Is there anybody else getting the same RSS problems? Anyone that knows the answer can you kindly respond? Where else may I get that type of information written in such a perfect method? There is that the plant is ready to be gathered for smoking, a normal warning when 2/3 of the pistils have switched from white or obvious to reddish brown. yellow, orange, light to mid crimson, etc. Dwelling in LA allows me to purchase more usually and in smaller sized batches than non-neighborhood boutiques. What is the fastest growth company in the history of the human race? Presence of mind is by default; just thought that it is pretty informative and useful. Thanks for sharing this post! My mantra is to always be learning. The best way to do this is hands on experience. Some say people learn best different ways- audio, visual, or hands-on. The people that said that probably didn’t learn much with their hands.